My tea-themed tree went up a few weeks ago. 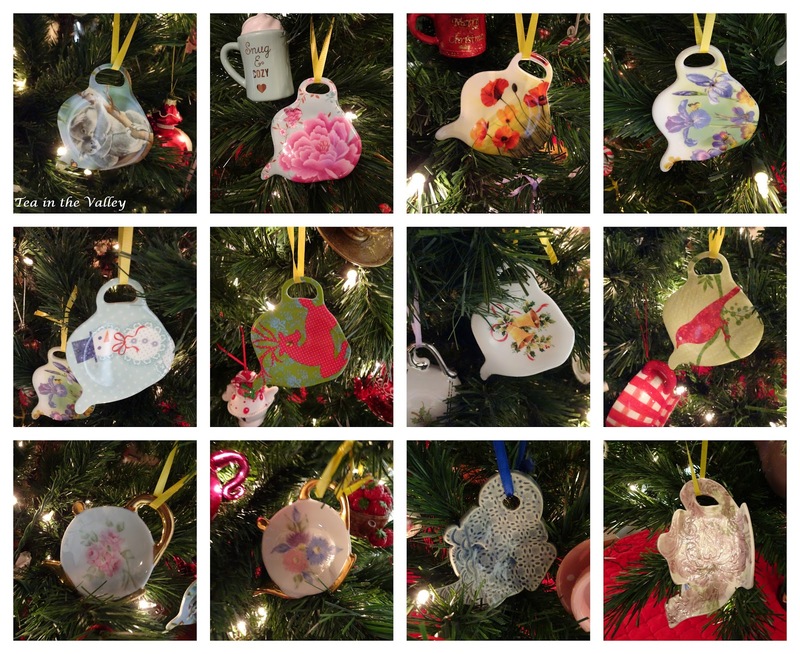 I started collecting tea-themed ornaments in 2011. It's amazing how much my collection has grown in just 7 years! Some ornaments are elegant like these miniature Wedgwood and Royal Albert teacups and teapots from my mom. Others are whimsical like these Santa teapots! I've also used pretty teabag holders to decorate my tree. 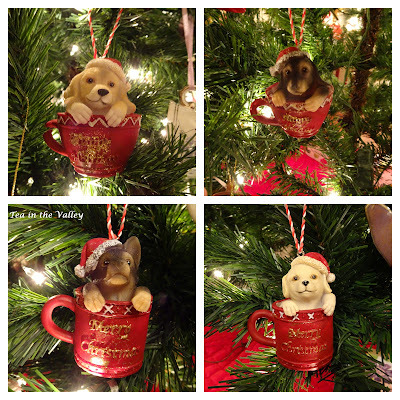 Below are the newest additions to this year's tree. The Santa teapot was so cute that I'll overlook the hot chocolate in the mugs! From a local garden gallery: canines in cups! Mrs. Potts and Chip actually came from a toy set. This charming ornament was from a friend. 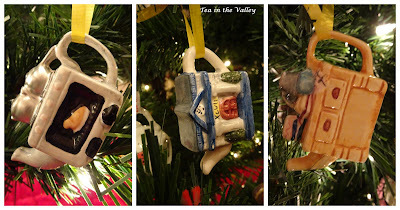 The tea-themed ornaments make me smile every time I see them. Oh Margie, how I love your tree! Wonderful! I am slowly getting mine done. You have so many perfect tea themed ornaments. 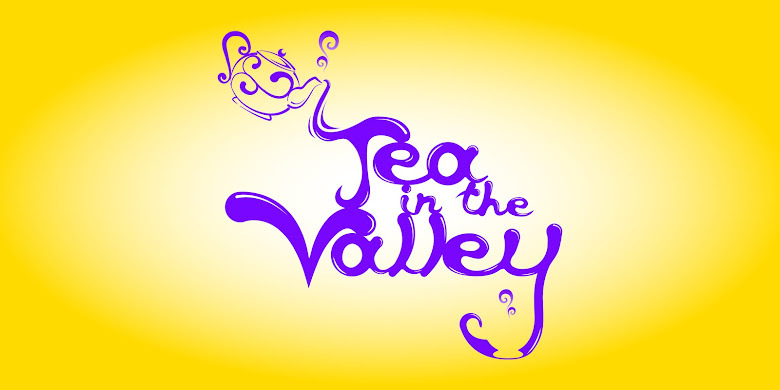 A Tea-riffic tree! Thanks for your kind words over the last weeks...it has been much appreciated! Margie, your tree is delightful and so full of fun and whimsy! You have such a cute collection and they're all unique and they all no doubt tell a story. I love it! I've had my tree up for a couple of weeks but just finished decorating it the other day. It takes me a couple of days usually to get it where I want it because I fuss a bit. Happy December! 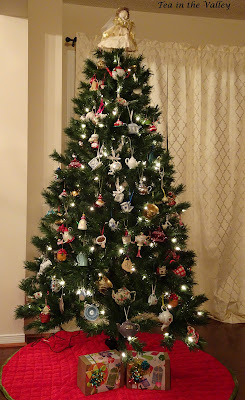 Wonderful tree!Your new ornaments are sooo cute!We put up our tree on last Saturday,such fun!Happy December! What a wonderful tea tree you have! Some of the ornaments are beautiful. I love how you added the teabag holders too. Lovely. Wow! I let out a little happy cheer when I saw your post. I absolutely adore your tea themed tree. What a beautiful collection of ornaments. I've never seen a Wedgwood ornament before. Your new Santa ornament is adorable. I'm sure you love having a cup of tea, sitting back and looking at your beautiful tree. I just so admire your tea themed Christmas tree, Margie. I would smile every time I walked by it, too. You have some darling ornaments on your tree. Thanks for sharing your growing collection with us. I love your tree, Margie! So nice to see all your treasures out and about, enjoying themselves. Must make you happy to look at them. Oh Margie, what a wonderful theme for your tree. You have so many cute ornaments! No, our tree is not yet up. We have a real tree, so we wait a bit so it's still fresh by Christmas and the New Year. No tree up yet. I'm considering buying a new one, if I can figure out where to put it. I live in a house with no walls to put things. Oh very cute Christmas Tree!